Buying a home for the first time is a major financial accomplishment. Before you begin the process to find your dream home, however, there are a few tips you should be aware of. To help you get started in your search for finding the perfect home, your local Hamilton mortgage broker with Canadian Mortgage Authority has listed some of the most common first-time homebuyer pitfalls and how to avoid them. The new “stress tests” the federal government implemented in 2017 have made it much more challenging for first time home buyers. One of the biggest mistakes I see are potential home buyers lured into the trap of low interest loans and leases with the promise of having a beautiful new car or truck. It is extremely easy to obtain financing for vehicles and a payment of $400 – $600 will have a significant impact on the amount of mortgage you will approved for, or even if you will be approved at all. Your best bet is to drive a modest used car at least until you have purchased your home and have a better sense of your overall budget as a new homeowner. If at that point you feel you need and can afford a new vehicle then go for it. Patience will pay off! By starting the process without talking to a mortgage professional, you may not know exactly how much you can afford. This means you could be wasting your time by viewing homes that are outside your budget and you could potentially get your hopes up if you fall for a home that you cannot afford. Knowing what you can afford can also give you more leverage when it comes to negotiating and placing bids on the homes you are serious about purchasing. The second part of the affordability equation is that you are comfortable with the mortgage payment. It must fit with your overall lifestyle, not just work on paper. We recommend speaking with your mortgage broker in Hamilton ahead of time so you know what price range to shop in. When beginning the home buying process, you do not need to work with your current bank. Remember the representative you are speaking with is an employee and works for the bank not you. As a mortgage broker, I work for you, not a bank. My job is to provide you with unbiased advice, and ensuring you get the best deal that meets your individual need. This ensures that you receive the best options for your financial goals. It is important to not automatically go to a broker who advertises the lowest mortgage rate up front, as you have to be aware of the fine print. Often there are limitations, and fine print associated with these offers. They attract customers with a “too good to be true” offer with the hopes of moving you to a different product. 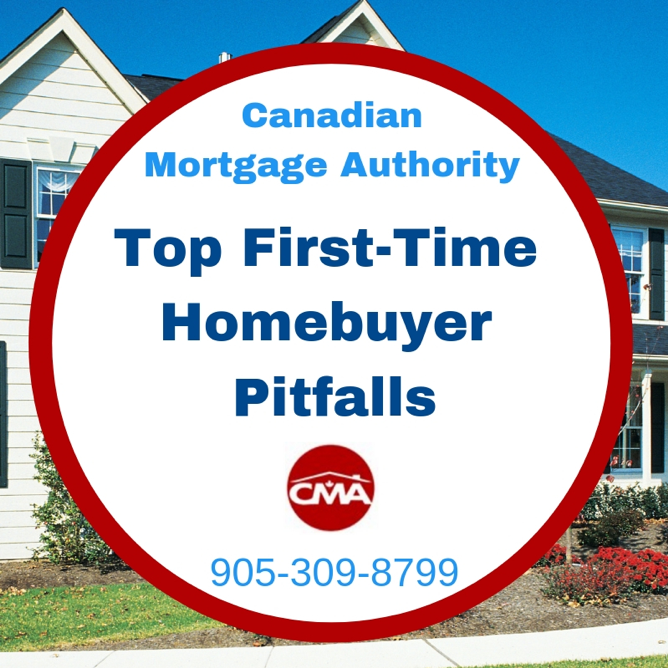 If you would like to receive more information on some of the most common first-time homebuyer pitfalls or if you are ready to apply for a Hamilton mortgage, please contact the Canadian Mortgage Authority team at 905-309-8799.